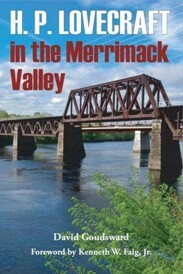 Foreword by Kenneth W. Faig, Jr.
H. P. Lovecraft in the Merrimack Valley is an exhaustive treatment of a subject that has rarely been discussed before, but that is of crucial importance to H. P. Lovecraft’s life and imagination. Foreword, by Kenneth W. Faig, Jr.
H.P. Lovecraft in the Merrimack Valley. By David Goudsward. New York, NY: Hippocampus Press; 2013; ISBN 978-1-61498-057-5; paperback; 198 pages. This book may be purchased in paperback from Amazon.com or Barnes & Noble or directly from the publisher, Hippocampus Press.